At the start of a new year, my husband and I commit to getting back into the good habit of daily devotions with our two boys. We usually do a good job of it until the holidays hit and then we just want to get the kids in bed at a decent hour. This year, I am happy to have found this lovely new book by Holly Hawkins Shivers to inspire me begin again. 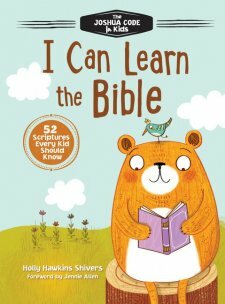 I Can Learn the Bible is the ideal one year devotional for parents to share with their children. Included is 52 Scriptures taken from several versions of the Bible including the International Children’s Bible, The New King James Version, and the New International Version. Some of the verses are not given as I remember learning them, mostly because I would have learned them in the King James Version. For instances, Week 1 is Genesis 1:1, In the beginning God created the sky and the earth. If I were asked to recite this verse from memory I would say, In the beginning God created the heaven and the earth. I love that this book is made to last all year and that it could be used year after year. I also find how the verses are explained to be ideal. It is though Shivers knows the questions my children are going to ask before they ask them. In my opinion, this devotional is appropriate for ages 4-9. It is written with both boys and girls in mind. The simple, yet colorful illustrations add to each week and definitely captured the attention my two boys. I was given a complimentary copy of this book by Booklookbloggers in exchange for an honest review. All opinions are my own and I have not been compensated.